Cups of hot cocoa topped with marshmallows, early morning frost on windshields and the turning back of the clock one hour are all telltale signs that the holiday season is quickly approaching. It’s nice to know that, even as the seasons change, love and appreciation of friends and family remain. As you decorate your tree, light your candles and prepare your holiday feasts, Murray Life will be there every step of the way. As always, with the help of Kimberley Cottingham, Kara McCombs and Rita Oldham, we have included a list of local and regional dining choices, a calendar of upcoming events for you and your family and a few new recipes to add to your holiday spread. Brian Truskey shows us how to make our homes not only beautiful, but safe, with tips from the Murray Fire Department and the Murray Electric System. Naturalist Aviva Yasgur sends a special greeting from LBL’s Nature Station and introduces us to her special friend—the opossum. Also speaking on behalf of the animals, Toni Anselmo-Napier discusses the pros and cons of giving our loved ones new pets as gifts. It’s a time of giving, but also for spending wisely: Ron Arant discusses more money matters and Kara McCombs handles all things shopping, with framed gifts for your holiday gifting. This issue’s Day Trip keeps us right here in Murray to experience the annual Tour of Homes. In the fourth installment of our “Murray Media” series, Darlisha Stanfield describes the inner workings of Charles and Margaret Shuffett’s Montage magazine. Our “Murray Media” series salutes local media outlets whose hard work provides residents and visitors with up-to-date information on the community and the world. This season is a time of celebration, so we celebrate a few of our neighbors’ outstanding achievements, such as the recognition of a local graphic designer at the Traverse Awards, and two authors whose work is now available to the world. Jessica Jeffress celebrates with “Hizhonor,” Mayor Tom Rushing, the 2008-2009 Citizen of the Year. We’ll also pause to say a sad but fond farewell to The Murray Civic Music Association, whose lively arts and joyful noises have shaped the lives in our community. We hope this holiday season brings you and your family warmth and comfort as you snuggle in front of a fireplace, humility and gratitude as you share your holiday spirit with the less fortunate, and prosperity and favor as the New Year approaches. May the joy of all the seasons be yours, from your friends at Murray Life. Thousands of people will visit Murray this fall, but only a modest percentage of that number will be here for formal homecoming events. Darlisha Stanfield put it best in her introduction to our featured section, “Homecoming season isn’t just about football games and parades; it’s about appreciating your home and family.” As we approach that time of year when weather will drive us from patios and playgrounds into the warmth and safety of the hearth, it’s nice to reflect on the wonderful homes we have. Our hometown is filled with some interesting folks. From Carruth, “the Hat Lady,” to Kenny Darnell, the literary outdoorsman who serves you in more ways than you ever knew, we’ll take you visiting in this issue. We’re sure you’ll find some surprising insights that will make you tip your hat to the spirit and energy of your neighbors. From Mary Schmidt’s look at migrating birds who make our homes a haven on the wing, to Darlisha Stanfield’s joyous look at the animals who have found a home at the LBL’s Nature Station, we’ll be reminded of the myriad of activities and attractions, west Kentucky (and Tennessee) have to offer. Jessica Jeffress takes you on a tour of WKMS-FM as a third installment of our “Murray Media” series. Kara McCombs shows you around the Paris Winery and Kim Cottingham heads a group of writers who welcomes visitors with updated insights into dining, lodging and entertainment. If you’re interested in saving a buck or two in the process, our staff has covered the shops and malls to bring you inside tips on stretching the household budget. We extend thanks to all those folks who offered their condolences at the recent passing of our long-time art director Bob McLean. Although he turned over the reins of the magazine earlier this year, Bob was still a part of Murray Life even as he continued to battle cancer. From Patti’s in Grand Rivers to Paschall Truck Lines, his designs drew attention and his art always accomplished the mission. We weren’t his family, you know; we just feel his loss as if we were. We hope you’ll find relaxation, smiles and entertainment on these pages. Whether you’re reading from the comfort of a fire on a cool, rainy day, or enjoying the warm sun of “Indian summer,” Murray Life will try to take you home. You won’t have far to go. Ready or not: it is almost time to go back to school. We know that, in a town like Murray, the return of regular, full-time schooling has a powerful effect on the economy, the traffic pattern, the number of things to do and the energy of Murray life itself. A big percentage of our population either attend public schools, is employed by a school or has children or grandchildren who will be acting in plays, playing on fields or courts, performing in bands and orchestras and otherwise demonstrating the good effects of education when administered in the right doses. Murray has given its name to one of America’s great universities, and when MSU cranks up to full power, the population of Murray expands noticeably in stores, at intersections and in pews and choir lofts, too. Thanks to Darlisha Stanfield, Jessica Heacock, Jessica Jeffress, Kim Cottingham, Kara McCombs and other Murray Life staffers for their diligent work on calendars, the restaurant guide and the various departments and features that make Murray Life an award-winning publication. 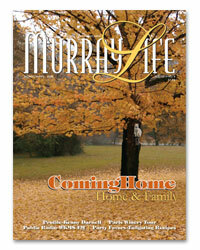 From dates to dinner ideas, the fruits of their labor are waiting for you on our Web site at www.murraylifemagazine.com. LBL Naturalist Julie Des Plaines joins us again, this time with some insights into the largest mammal in our local nature: the whitetail deer. Financial columnist Ron Arant schools us in the ins and outs of financial planning in a way that will guarantee you get your money’s worth from your tuition, and our own Kara McCombs takes you on a backstage visit of plans for the upcoming “Hot August Blues” festival at Kentucky Lake State Resort Park – the last big bash before school starts. 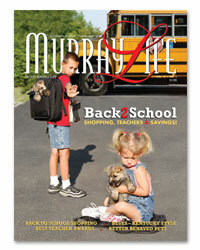 Murray’s Kathy Hodge tells us about taking your pet back to school. (We assume that the fish in your aquarium are excluded since they are already enrolled in a school.) Darlisha Stanfield introduces us to Murray’s outstanding teachers, and MSU yearbook editor Jessica Jeffress salutes Murray’s medium of record: the Ledger & Times. It’s the second installment in our new series, “Murray Media,” which examines all the ways the people of Murray learn about themselves and the world around them. We hope Murray Life has been as helpful to your continuing education as required classes and as much fun as the Senior Prom – maybe more! We hope you look at Murray Life as a date – not as homework. We hope you like us, and . . . well, you know the number. See you at the game! Be it ever so humble, we’d like to make it better. We know there’s no place like home, but few of us can resist the temptation to make a few little changes—or one big one—from time to time. Summer seems to be the perfect time: windows can be open to air out freshly painted spaces; construction can proceed without fear of snow or cold. Yes Ma’am: summer means home improvement. Thanks to Darlisha Stanfield, Emily Bullock, Casey Northcutt, Kara McCombs and Corey McBee for their insights into home improvement. Just to make sure you have it when you need it, we’ll have it handy for you on our website at www.murraylifemagazine.com so you can view it and share as you choose—and we hope you choose! LBL Naturalist Aviva Yasgur gives you plenty of inspiration with a lighthearted look at animals (and insects) who build and remodel. Ron Arant will raise some issues about building a strong financial “house” in his column on financial planning, and our Savvy Shopper column will help you decide how to make the ol’ homeplace a bit safer with some tips on smoke and carbon monoxide detectors. As usual, we’ve included our suggestions for dining and recreational opportunities to enhance your summertime leisure and to delight your summer visitors. From recipes for picnics and backyard get-togethers to summertime shopping and decorating tips, we are ready to head into the lazy, hazy, crazy days with you. As long as we’re waving, we should bit adieu to Adam Jarvis, our design intern, and to Emily Bullock, a staff writer and editor. Both were students at Murray State until graduation day, and we wish them the best with new jobs and new studies. If you’re a regular reader of ours, then their words and images have been a part of your life. We hope Murray Life fits your home improvement plans. What home cannot benefit from a little information, a touch of insight, and some smiles and laughter? Thanks for inviting us in; you can be sure we will hope to earn a return visit. We’ve been hearing those words from every side in recent months. 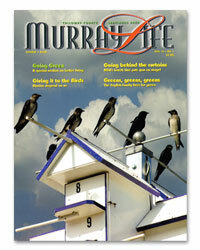 “Green” is the hot, new color for 2008, and Murray Life is putting on the green as well. In this issue, we invite you to celebrate the season of rebirth by paying attention to nature. We’ll share with you how life can be better, less expensive, and much less harmful to the environment. 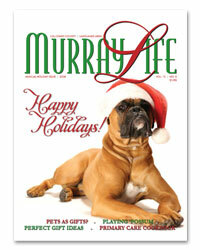 It takes some planning and some straightforward information, and this issue of Murray Life has all of that. We’ve concentrated our “Green space” in a special section, and the full-color, special interest pages will become a regular feature of the magazine this year. 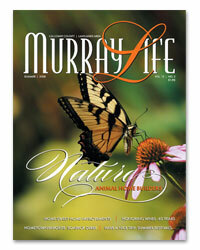 www.murraylifemagazine.com so you can view it and share as you choose – and we hope you choose! But some things are unchanged in 2008: LBL Naturalist Julie Des Plaines salutes that harbinger of spring, the Purple Martin, in our regular feature on nature. Ron Arant will talk about saving the “green stuff” in his column on Financial Planning, and our Savvy Shopper column will include hints on saving money while strengthening the natural world. The folks at Murray Electric System share recipes from their new cookbook, and the proceeds are bound for this year’s Relay for Life. We also welcome guest writer Samantha Wilber, who tells the remarkable story of a young man who lives his childhood’s happiest times every day. Chad English gets to “play” outside, and he loves it. We’ll take a moment to reflect on Tab Brockman who has meant so much to the Murray-Calloway County Chamber of Commerce for half a decade and is now turning his attentions to growing another local business. And, we’ll take you backstage at MSU’s cavernous Lovett Auditorium for a surprisingly intimate concert. As usual, in each issue we’ll suggest dining and recreational opportunities to enhance the start of a new year. From recipes to shopping and decorating tips, we are preparing to shed the dreary spirits and cabin fever of winter (although it wasn’t too bad, was it?) and launch into Spring 2008 with an eye toward fun, fancy and factual articles. We hope you’ll find Murray Life to be as filled with promise as the warmest spring day, and as fertile a ground for your inspired ideas as any garden patch in the county.